ActiveCampaign vs GetResponse: 2018 Discount! ActiveCampaign vs GetResponse Comparison: Which One Is Right For You? If you’re part of a B2B business that has a longer sales cycle, you’ll like ActiveCampaign’s CRM tools and focus on helping you land higher-value clients and customers. Actually, to make things even simpler, if you do any B2B sales, you should get ActiveCampaign. If you’re part of a small business or agency that sells directly to consumers, you’ll like how easy GetResponse makes it to create, customize and manage your campaigns. In short, if you send B2C emails, you should get GetResponse. If you run a small business and need software to manage your email campaigns and marketing automation, there’s no shortage of options out there. ActiveCampaign (Visit Website) and GetResponse (Visit Website) are two of the most popular email marketing tools available right now. Both are designed for small and mid-sized businesses and include a range of great email marketing tools, from autoresponders and broadcasts to automation systems. But the two products also have a few significant differences. GetResponse is designed to be an all-in-one marketing platform for everything from emails to webinars, with landing pages, email templates and other tools aimed specifically at online marketers. ActiveCampaign, on the other hand, is a more focused marketing automation and sales tool that comes with a CRM tool to help your marketing and sales collaborate and follow up on prospects and accounts. Below, we’ve compared ActiveCampaign and GetResponse to help you choose the best tool for your needs. Our guide starts by comparing each platform’s features, before looking at the major advantages and disadvantages of each product. If you’ve narrowed your search down to ActiveCampaign and GetResponse but still aren’t quite sure which product to buy, make sure you keep reading to learn which tool is best for you. Designed For Bloggers, business owners and email marketers in need of a user-friendly email marketing and marketing automation system. Email marketers, SMBs and enterprise customers in need of a reliable, scalable email marketing platform. Contacts Plans start from 500 contacts, with pricing available on request for users with lists of 100,000+ contacts. Up to 1,000 subscribers on $15 per month Email plan. Plans available for 5,000, 10,000, 25,000, 50,000 and 100,000+ subscribers. Users Up to three users on Lite plan, 25 users on Small Business and unlimited users on Enterprise plan. One user on Email plan, with support for 3-10 users for Pro, Max and Enterprise customers. Email Courses Unlimited autoresponder series on all plans. Unlimited autoresponder series in all plans. Automation Rules Unlimited automation funnels on all plans. Basic automation included in Email plan, with full marketing automation features for Pro, Max and Enterprise customers. Responsive Email Templates A huge selection of responsive email templates are included, with a free design customization service for Plus and Enterprise level customers. Over 500 responsive HTML email templates are included. Email Split Testing A/B email split testing is possible. A/B email split testing is possible. Lead Scoring Dynamic, customized lead scoring. Lead scoring based on user behavior and activity. SMS Marketing Automation Automated SMS and subscription via SMS are available. GetResponse does not natively support direct mail automation, however Zapier integrations are available for Call Loop and other SMS marketing tools. Direct Mail Automation ActiveCampaign does not support direct mail automation, although integration with direct mail tools is possible using Zapier. GetResponse does not natively support direct mail automation, however a Zapier integration is available. UI and Usability Designed for non-technical users, with a clean UI and simple email/automation interface. Designed for non-technical users and power users alike, with a clean and intuitive UI. 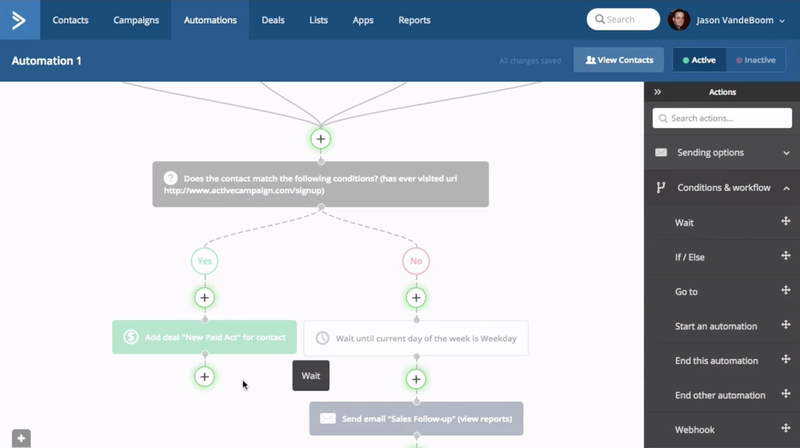 Automation Workflow Builder Automation workflow builder uses simple yes/no conditions and rules that users with no programmming experience can understand. Drag-and-drop automation workflow builder with visited URL and purchase tracking. Email Course Builder Drag-and-drop email builder with data-driven segmentation and useful campaign insights. User-friendly Email Creator with time and action-based autoresponders. Form Builder Form builder with inline, floating box, modal pop-up and floating bar display modes. All-in-one web form builder can create newsletter sign-up forms, order forms, feedback forms and more. Landing Page Builder No landing page builder, although integrations are available for software like Instapage and LeadPages. Drag-and-drop WYSIWYG landing page editor makes creating responsive landing pages easy. Landing Page Templates No landing page templates, although templates are available for third-party software. More than 100 professional opt-in page, sales page, download page and video landing page templates included. WordPress Plugin ActiveCampaign WordPress plugin lets you add contact forms to pages, posts and sidebars and add tracking to your WordPress website. WordPress integration plugin lets you easily add subscription forms to your WordPress website. Integrations More than 150 apps and integrations, ranging from scheduling tools to landing page software. More than 133 integrations with CRM tools, CMSes, e-commerce platforms, landing page software and more. Pricing Monthly fee, starting from $9 per month for up to 500 contacts. Pricing available on request for high-volume email marketers. Free 14 day trial available. Monthly fee, starting from $15 per month for up to 1,000 contacts. 30 day free trial available. Refund/Guarantee No full or partial refunds. No refunds available after risk-free trial period. Support Personalized support via phone, email and chat, as well as video walkthroughs, user community and one-on-one training. Personalized support via phone, email and chat, as well as the GetResponse learning center. Phone support available from 9AM to 5PM EST, Monday to Friday. Out of ActiveCampaign and GetResponse, which software has better features? ActiveCampaign and GetResponse are both great software, but they have very different focuses and core features. ActiveCampaign is designed for online and offline marketing and sales. As a result, many of its features (such as its CRM and SMS messaging) will appeal to B2B businesses but won’t be as much of a strength for B2C companies that primarily sell online. GetResponse, on the other hand, is designed as an all-in-one online marketing toolkit, with key features like email marketing and landing pages that online B2C businesses will love. Opt-in Forms & Landing Pages: Which Tool Comes Out on Top? Winner: GetResponse, which includes all of the same forms as ActiveCampaign and a few more, plus a landing page builder and a large variety of useful page templates. ActiveCampaign and GetResponse both have opt-in form builders. However, only GetResponse comes with native landing pages. For ActiveCampaign, you’ll need to use a third party tool and integration to generate email list leads from your landing pages. Inline forms, which appear inside blog posts and other text content and let you leverage your written content to add users to your email lists. Floating box forms, which float in the lower corner of your website and let users enter their information after reading content. Modal pop-up forms, which pop up on top of your website and let you add subscribers to your email list when they visit your website. Floating bar forms, which stick to the top of the browser window and let you passively generate leads using your website content. All four form options are customizable using the ActiveCampaign form builder, which allows you to drag and drop fields onto your form, adjust its text, change the colors and other style options, customize the “Thank you” message and even add slide in and fade in effects. ActiveCampaign comes with a WordPress plugin, letting you easily add forms to your website or blog. You can also use a simple or full embed code to add the form to your website, or even add your opt-in forms to your Facebook page. Although ActiveCampaign doesn’t include any landing pages, it does integrate with landing page tools like Leadpages, Instapage, and Unbounce, giving you the ability to add users to your email list from your PPC landing pages. GetResponse also has a powerful form builder that lets you create a wide range of stylish and effective opt-in forms. Download box forms, which let you use an eBook or product download to generate email leads. Modal exit pop-ups, which let you capture traffic and generate email leads as people exit your website. Scroll forms, which float in the lower corner of the browser window and help you add users to your email list as they read your website’s content. Fixed bar forms, which stick to the top of the browser window and give users the opportunity to opt in without getting in the way of your website. GetResponse also has a few extra form style options, such as a “shake box” modal pop-up that shakes to get the user’s attention. The form builder in GetResponse includes a good range of customization options. You can edit your form’s color scheme, fonts, text size, style and other options. You can also add images to any opt-in form to provide more information for users and increase conversions. GetResponse forms integrate with WordPress, Facebook, PrestaShop, WooCommerce, Joomla and a variety of other platforms. Unlike ActiveCampaign, which doesn’t have native landing pages, GetResponse has a landing page builder with hundreds of responsive templates to choose from. It also includes thousands of free stock photos to help you customize your landing page to match your product or offer. Winner: Both platforms score highly in this category. If you need a versatile email marketing tool, you’ll get a lot of value from either option. ActiveCampaign and GetResponse both include powerful email marketing tools, with features like email broadcasts, autoresponders, and email builders. Both applications also have email marketing automation tools like a behavioral email based on page visits, links, and purchases. ActiveCampaign’s email marketing features are more than enough for most small and mid-sized businesses. There’s a powerful email builder with a drag-and-drop interface, a good selection of email templates and features like dynamic personalization. Setting up email campaigns in ActiveCampaign is quick and easy. ActiveCampaign allows you to create conventional autoresponders that send emails every few days, or send broadcasts to your entire list at once to announce new products and offers. Since ActiveCampaign includes email split testing, you can easily optimize your subject lines and content to achieve the best open rate and ROI. You can also add dynamic content to your emails to display variables like a subscriber’s name, country or recent purchases. 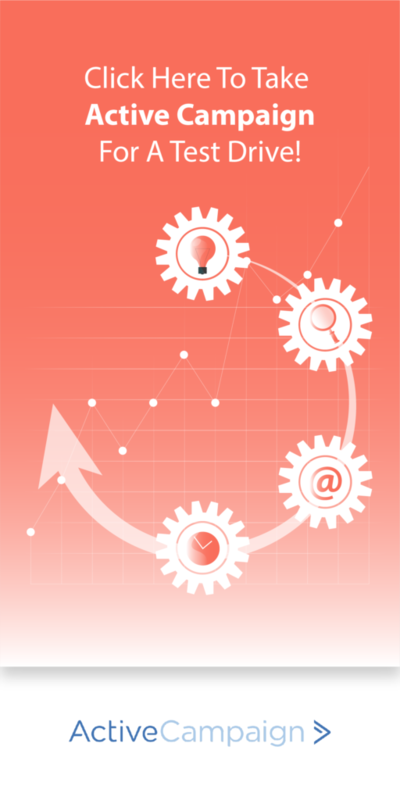 ActiveCampaign also includes powerful marketing automation tools. Using the Automations tab, you can create workflows that segment subscribers or update users’ data after they visit certain URLs or match other conditions. This makes it easy to do things like follow up after users buy a specific product or request more information about an event. ActiveCampaign also includes conditions for common events like cart abandonment, helping you recover lost sales and increase revenue. One nice feature of ActiveCampaign is that allows you to use SMS integrations for marketing automation — something that’s missing in many other marketing automation platforms. All in all, ActiveCampaign’s email and marketing automation features are more than enough for most small and mid-sized businesses. The fact that it includes SMS marketing automation is an extra bonus, especially if you have phone number data for your customers. GetResponse is one of the oldest email marketing tools on the market, dating back to 1999. Its email marketing features are robust and powerful, with a selection of more than 500 templates to choose from and a powerful email creator that lets you create great-looking emails. You’ll find all of the usual email marketing features in GetResponse. Creating autoresponders is quick and simple, with options to send emails at specific intervals or sync your campaign with a user’s local time zone for the highest response rate and ROI. GetResponse also lets you send broadcasts, customize emails with dynamic content, preview how your emails will look in each user’s inbox, integrate your campaign with social media and customize your email preheaders for a better open rate. Like ActiveCampaign, GetResponse has A/B testing tools to help you split test your emails and find the best subject line, body copy and call to action for your campaign. GetResponse also includes a powerful range of marketing automation features. You can tag and segment users based on web events like visiting a specific URL or purchasing a product, trigger automated emails when users abandon their cart and automate follow-up emails for when users fail to respond to your initial messages. The workflow builder in GetResponse is easy to use, even for people with no real programming experience. A huge range of conditions, actions, and filters are included to help you automate almost every aspect of your email marketing process. GetResponse doesn’t include any SMS features, although it does integrate with Zapier for SMS and phone notifications. On the whole, GetResponse feels slightly more complete as a B2C email marketing tool, with a great range of features that are perfect for brands, e-commerce businesses and agencies that deal directly with customers. Winner: ActiveCampaign, which has a powerful CRM module that’s perfect for managing your B2B prospecting and relationships. Do you have a sales team? Only one application, ActiveCampaign, includes a CRM, making it the better option if you run a B2B business. One very cool feature of ActiveCampaign is that it includes a versatile and powerful CRM that includes all of your personal email, email marketing, and automation data. This makes ActiveCampaign ideal for B2B businesses that need to stay up to date with their clients and prospects. If you have a sales team, they’ll appreciate being able to see exactly what’s happening on the digital marketing side of your business. If you use Gmail, Outlook, or other common email providers, you can natively integrate your email inbox with ActiveCampaign, letting you view all of your sent and received emails with every client from one application. This feature makes ActiveCampaign an awesome tool for B2B businesses, especially if your business has a long sales cycle that requires multiple calls and follow-ups with prospects and clients. GetResponse does not come with a built-in CRM. However, it integrates with 20 popular CRM tools, ranging from small business software like Zoho CRM and Highrise to industry giants like Salesforce. Which Tool Wins When it Comes to Features? If you run a B2B business with prospects, clients and service work, ActiveCampaign’s feature set makes it a better match for your needs. Its CRM is an especially nice feature that makes it easy to synchronize your email marketing and direct sales. If you run a B2C business like an e-commerce website, you’ll probably find GetResponse to be a more useful piece of software. It comes with more templates, has a more robust set of email marketing features and just feels more like a tool built with B2C businesses in mind. ActiveCampaign is a great tool for B2B businesses, largely thanks to its built-in CRM. It’s also great as a general email marketing and marketing automation tool, especially if your business sends SMS notifications to customers. ActiveCampaign is relatively easy to use, with a clean user interface that anyone can learn their way around over the course of a day or two. From broadcasts to autoresponders, dynamic content and more, ActiveCampaign comes with all of the email marketing features you’d expect from software in this price range. The email builder in ActiveCampaign is easy to use and powerful enough to help you create engaging, professional looking email templates. Because ActiveCampaign has A/B testing, you can compare your subject lines, copy and calls to action to identify the top-performers and improve your ROI. ActiveCampaign has a variety of lightweight, responsive opt-in forms that integrate with WordPress and embed easily on static HTML websites. 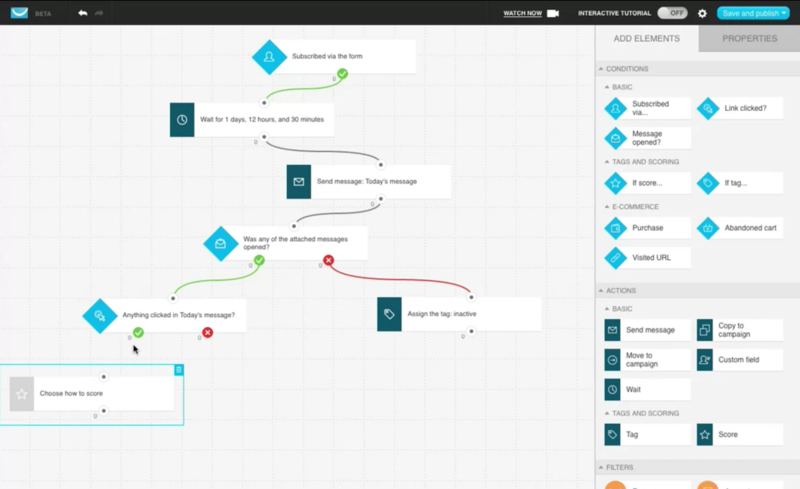 The marketing automation features in ActiveCampaign are easy to use, letting anyone create workflows for tasks like recovering an abandoned cart or upselling a product. ActiveCampaign supports SMS marketing, letting you send SMS notifications to your customers as part of your automation workflows. Since ActiveCampaign has its own CRM, it’s extremely convenient for B2B businesses with sales teams. There are no landing page templates included with ActiveCampaign and no landing page builder, meaning you’ll need to rely on third party software like Leadpages or Instapage for your PPC landing pages. ActiveCampaign is a good all-round email marketing and marketing automation platform, and an exceptionally good platform for B2B businesses. If your business has a long sales cycle, adding ActiveCampaign to your toolkit can help you close more deals and generate more revenue. 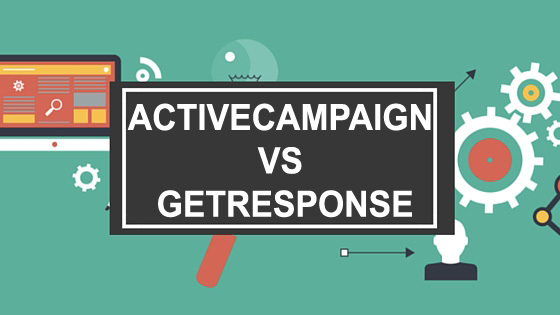 Compared to ActiveCampaign, GetResponse has a much bigger focus on B2C marketing. If you sell digital products, operate an e-commerce store or work as part of a digital marketing agency, there’s a 99% chance you’ll prefer GetResponse to ActiveCampaign. GetResponse includes more than 500 email templates, letting you easily create pro-level emails for everything from discount offers to abandoned cart recovery messages. The email creator in GetResponse is one of the best in any small business tool, with a huge range of customization options to help you create great-looking emails. GetResponse has all of the email marketing features you need to run a highly effective campaign, from broadcasts and autoresponders to personalization and dynamic content. Full A/B testing and analytics tools are included in GetResponse, letting you test subject lines and other email content to find top-performers and run a more profitable campaign. GetResponse includes a powerful marketing automation system that’s also refreshingly easy to use, with a simple interface that anyone can master. Unlike ActiveCampaign, GetResponse includes a landing page builder and hundreds of landing page templates for your PPC campaigns and promotional efforts. GetResponse is one of the only email marketing platforms on the market to include a webinar marketing solution, making it a perfect choice if you host webinars. GetResponse doesn’t include any SMS marketing automation features, although it does integrate with Zapier to send SMS notifications. GetResponse also doesn’t have a CRM tool, meaning you’ll need to integrate it with a different CRM application to replicate the functionality of ActiveCampaign. If you run an e-commerce website or digital brand, there’s a 99% chance you’ll get more value from GetResponse than ActiveCampaign. Not only does it include landing pages and a wider range of email templates — it also feels like a more robust, complete tool for B2C businesses. ActiveCampaign and GetResponse both start out very affordable but become more expensive as your list grows in size. The Lite version of ActiveCampaign is available for $17 per month and allows a maximum list size of 1,000 contacts with unlimited sending. This version of ActiveCampaign doesn’t include the CRM, making it a good option for small B2C businesses that just want email marketing. For the full version of ActiveCampaign, you’ll need to pay at least $49 per month. Pricing varies based on the size of your list — you’ll need to contact ActiveCampaign’s sales team for pricing information if you have more than 50,000 contacts. GetResponse starts from $15, which allows for up to 1,000 contacts and full email marketing features. This plan also includes limited access to GetResponse’s marketing automation tools, with workflows and tags but no abandoned cart recovery or web event tracking. For full access to GetResponse’s marketing automation tools, you’ll need to sign up for the $49 per month Pro plan. GetResponse also offers Max and Enterprise plans, which are priced from $165 and $999 per month. ActiveCampaign has a huge online support knowledge base, with everything from online guides and videos to live support. There are also several active ActiveCampaign groups on Facebook, such as Official ActiveCampaign and Automation Nation. GetResponse has a detailed online support center with guides, webinars, and marketing white papers, plus live support by chat or phone. If you run a B2B business, you’ll get a lot more value from ActiveCampaign than you will from GetResponse. Features like the built-in CRM make it a perfect choice for agencies and service businesses, especially if you have a long sales cycle that takes in email and on the phone. In short, if you run a B2B business, get ActiveCampaign for its CRM features, which are perfect for sales teams. If you run a B2C business, you’ll like GetResponse more than ActiveCampaign. Features like the built-in landing page builder and huge selection of email templates make it a much better choice for e-commerce and digital product businesses. If you send B2C emails, you’ll like how easy GetResponse makes it to create landing pages for lead generation and product sales. What Software is in Your Email Marketing Toolkit? ActiveCampaign and GetResponse both pack seriously powerful email marketing tools into clean, user-friendly interfaces. However, they’re definitely not the only email marketing tools available right now. What email marketing and marketing automation software do you use on a daily basis? Let us know about your software toolkit in the comments and we’ll make a note of any interesting apps and tools for future product reviews and comparisons.